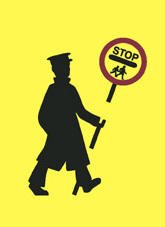 “As agreed, we placed a temporary School Crossing warden on Sir George Martin Drive at Adel Primary School, for four weeks, in order that we monitor the traffic flow and the number of pedestrians crossing. This trial period had now ended and we have analysed the statistics and I can confirm that the numbers of both pedestrians and traffic warrant the need for a warden. Thus we are able to establish a permanent site, which will be fully funded by the authority. We are in the process of advertising for a number of vacancies and we will include the site at Adel in this recruitment process. In the meantime, if you need any further information please do not hesitate to contact Cllr Barry Anderson directly. ← Would You Like to Protect A Pavement?